Drummer Terry Silverlight's interesting and varied career dates back to his first session on brother Barry Miles' highly-regarded album White Heat (Mainstream, 1971), when he was only 14. He's since gone on to frequently high-profile gigs with Mel Torme, George Benson, David Matthews, Phil Woods, Tom Jones, Roberta Flack and many others as well as appearances on countless films, television scores and advertising jingles. Like the best session men, Silverlight can fit himself easily, comfortably and masterly into any situation. In his own recordings though, he seems to favor the brand of challenging jazz fusion that was first heralded by Weather Report and the Brecker Brothers in the 1970s and torch-carried into the 1980s by Steps Ahead, the Chick Corea Elektric Band, the Zawinul Syndicate and the rather still under-respected Yellowjackets. 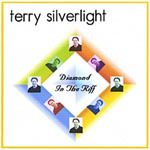 On Diamond in the Riff, Silverlight's third album as a leader, the drummer hones his point to a finely sharpened craft. Brother Barry, briefly featured on the drummer's eponymous first disc (CEI, 1997), is showcased throughout here on piano with ubiquitous bassist Will Lee, who returns from the drummer's previous disc Wild!!! (Silverlight, 2003), forming, with the drummer/leader, a powerful and most captivating trio at the base of this fusion redux. Oddly, and most gratifyingly, it works. It's a varied and well-programmed testament to how interesting and diverse good fusion jazz can be. While it seems most jazz players today are trying to capture something that predates or postdates true jazz fusion, Silverlight is happy to seize upon that sound, circa something 1976-1989, before "smooth jazz" took over this art form. Despite some brief tom rolls on the opening "Nature Drum," Silverlight doesn't force-feed his drum chops as most drummer-leaders are wont to do. Here, as before, he is all about the final sound to which he contributes greatlya mellifluous sound that has nothing to do with submission beating. Here, it's more about the melody and the rhythm. This is most apparent on the title track, a showpiece for Miles' piano and minimoog capabilities in conversation with Silverlight's aggressively interesting stick work. Miles and Silverlight engage most attractively throughout, particularly on the duo's "Do It." Miles fares especially well all through the disc and is, perhaps, its greatest attraction. He is notable on "The Velvet Room," a lovely and dreamy piece that recalls Wanderlust-era Mike Mainieri and features David Mann's nice flute work, Miles' own "Plaza Mexico" (with Aaron Heick on soprano sax), the funky "Earth Blues" and the rousing "PT" (where David Mann recalls the lamentably lost Michael Brecker). At 74 minutes, Diamond in the Riff contains a fair bit of filler ("Boulevard," "Monkey Dance," "Eye Of The Beholder"). But it's easy to hear these "breathers" as engaging respites for the more dramatically-charged tunes noted above. As the title suggests, there are diamonds in the riffs heard here that will appeal to any listener who favors this excellent and entirely worthy brand of jazz fusion. Track Listing: Nature Drum; Boulevard; Diamond In The Riff; Nothing Like Today; The Velvet Room; Do It; Monkey Dance; Tom Boy; Plaza Mexico; For The Rest Of My Life; Earth Blues; Freetom; PT, Eye Of The Beholder; Vinyl Song. Personnel: Terry Silverlight: drums, percussion, keyboards, vocal (4); Barry Miles: piano, minimoog (3); Will Lee: bass; David Mann: sax: Aaron Heick: sax; Glenn Alexander: guitar; Tabitha Fair: vocals (10); Lew Soloff: trumpet (4); Bob Malach: tenor sax (4); Larry Farrell: trombone (4); Allan Molnar: vibes (4).